Senate President Dr Bukola Saraki has described the siege on the National assembly complex yesterday as an act of cowardice by those seeking to effect an illegal impeachment of the Senate leadership in flagrant disregard of the law, Saraki said this today at a world press conference he addressed in Abuja. He also commended the acting President Prof. Yemi Osinbajo for handling the DSS siege at the national assembly yesterday very well, also single out for praise Hon. Boma Godhead who dared the masked operatives of the DSS to shoot her. Dr. Saraki described the forcible shutdown of the legislature as an unconscionable assault on a national institution, he thanked all who stood to ensure the failure of the siege on the National assembly. 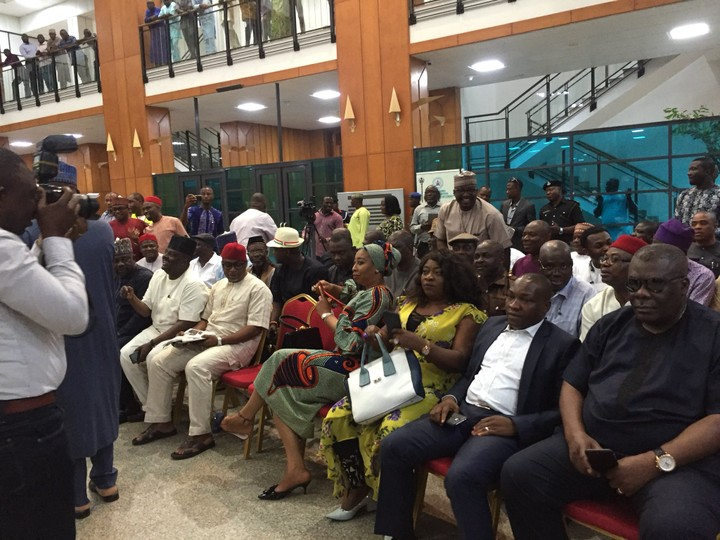 The Senate President narrated how lawmakers and staff of the National Assembly were prevented from entering the national assembly Complex by heavily armed security agents of the Department of State Services (DSS). All entries to the Complex were blocked.” He said. The National Assembly, the seat of democracy in Nigeria, was under lockdown. Senators and Members of the House of Representatives were prevented from gaining access.” Remarked the Senate President. Senator Bukola noted that “The ensuing standoff was a show of shame that played itself out over several hours in full view of the country. In no circumstances should this have happened. And we as a nation reaped the bitter fruits.